Everything you need to know about Pontoon boats can be found right here. Pontoon boats are an increasingly popular way to get out and enjoy the water with your friends and family. And, there are lots of good reasons why. Thanks mainly to advances in pontoon tube design, new boatbuilding materials, innovations in outdoor fabrics, and lighter, more efficient outboard engines, pontoon boats are no longer the relatively slow, somewhat cumbersome “party barges” they’ve traditionally had a reputation for being. Today we see pontoon boats with as much as 900 horsepower strapped to the stern and top speeds in the 60s. Many also have interiors that look and feel as nice as the inside of a fine luxury automobile. They can carve a turn, too, with performance pontoon “tube” packages that allow them to corner as well as many conventional fiberglass-hulled boats. But what if you’ve never considered a pontoon boat? What if pontoon tube design makes as much sense to you as, say, rocket science? Or what if you’re not sure if a pontoon boat is right for you? Well our aim here is to give you enough of a foundation in pontoon boat basics that you can wisely research, choose, and then find the right pontoon boat for you—or maybe decide if a different type of boat is a better bet for your style of boating. Read on and we’ll discuss the ins and outs of this fun, relaxing, yet exciting class of boats. Think pontoon boats are slow and ungainly? Think again. The best place to start is with what a pontoon boat actually is. Generally speaking, it’s any sort of boat with a large, flat deck that’s mounted atop two or more metal tubes called pontoons. Boats with three pontoons are sometimes called “tri-toons.” These pontoons—or “tubes” for short—contain a lot of reserve buoyancy and allow designers to create massive deck plans fitted with all sorts of accommodations, such as expansive lounge areas, stand-up bars, and sun pads. Better tube design has also allowed builders to put ever-increasing amounts of horsepower on the stern. The most basic of pontoon boats start out with two relatively plain, round tubes that taper to a point at the forward end. They’re almost always made out of welded sheets of marine-grade aluminum. Inside the tubes is where fuel tanks usually reside, as well as stowage areas. Atop these tubes is where manufacturers weld deck support channels and cross beams—the support structures to which the pontoon’s deck will be mounted. These support channels are what give a pontoon its rigidity, a key component in the ride and feel of a pontoon boat. The devil is in the details, when it comes to pontoon boat construction. Knowing the right questions to ask about a pontoon boat’s components can prevent headaches down the road. Note the fuel tank in the center tube, aft, and the stowage area farther forward. Next comes the deck. Most builders use varying grades and thicknesses of plywood covered with carpet or vinyl flooring materials. Aluminum “fencing” and side panels come in next around the perimeter of the deck before seats, lounges, helm unit, and other interior components and mechanical and electrical systems are added. Engine(s) are the icing on the cake before the pontoon rolls off the factory floor. In addition to inquiring about warranties that cover tubes, deck, and other components, it’s definitely worth doing your research and asking plenty of questions about construction methods and materials. Questions such as, “How do you waterproof and treat the deck?” or “How are the support structure and tubes engineered?” are good ones to ask or research on your own. The better the materials, craftsmanship, and engineering are, the better—and longer lasting—the pontoon boat will be. Something you will discover, when it comes to pontoon boats, is that manufacturers will generally build one for you in any number of configurations and with all sorts of options and add-ons. So much so, in fact, that it can become intimidating and/or confusing. Maybe you’d like four chaise lounges, purple upholstery, and sea grass-look floors. No problem. Or maybe you want a double-decker, twin-engine pontoon with a waterslide and joystick docking. While these options can send a 24-footer with a base price of $20,000 quickly into the stratosphere, it’s a good idea to know which ones you’ll want and make the most use of. Your imagination is about the only limitation, when it comes to customizing a pontoon boat. Interior/Exterior Packages—Pontoon boats are highly modular, meaning each model can have as many as a 20-plus different exterior and interior layouts and schemes. And if that wasn’t confusing enough, there’s generally dozens of different fabric, upholstery, floor covering, and graphics packages to consider. Phew. The good thing is that most manufacturers have websites where you can build and price your pontoon just the way you want it, from the Bimini top down to the accent graphics, in virtual reality. Engines—Almost every pontoon model available, from 14 to 30 feet, comes with a standard engine that almost anyone would find underwhelming. This means most folks end up choosing a larger, more powerful power plant or power plants. Consider how fast you really want to go, how much fuel you can afford to burn, and what you’ll be using the pontoon boat for. Most outboard manufacturers have performance and fuel consumption bulletins available for many of the new boats that use their engines, so it’s worth doing some research on their web sites, too. Analyzing this data will give you a general idea of the size engine you’ll want on your pontoon. Also, remember that choosing an outboard for a pontoon is somewhat different than it is with other boats. Some engines are specifically designed for pontoons, and in other cases, special propellers or gear ratios are in order. Read The Outboard Expert: Outboards for Pontoon Boats, to learn more about the specifics. Pontoon boat builders use all sorts of tube engineering to get better performance out of their pontoon boats, such as keels, under-deck skins, elliptical-shaped tubes, and lifting strakes. Performance Pontoon Packages—These performance-oriented packages often add an additional tube or larger tubes, tubes with lifting strakes and/or keels, under-deck skins, or tubes that are specially shaped—and more. These special tube “add-ons” not only improve performance—especially in turns—but also provide additional buoyancy, which means larger engines can be fitted, upping your speed game. This Premier pontoon boat has all of its systems integrated into an in-dash touchscreen unit, one of many electronics options available on pontoon boats. Electronics/Sound Systems—Pontoon boat helms don’t generally have extensive marine electronics aboard. But, if you’re a tech nerd, there are plenty of builders who have options such as integrated touch panel control systems, chartplotters, and other electronic gizmos to keep you happy. Stereos are also a big deal on pontoon boats, in case you didn’t know. One builder we looked at offers 18 different stereo and speaker combinations on each of its pontoons. Oh, and then there’s the LED lighting packages. While some of these packages might seem tacky, many actually increase the usability of the boat during low light periods, lighting up cup holders and strategic deck areas. Though you will find a scattering of pontoon boats in coastal areas, they’re most commonly found on inland lakes, rivers, reservoirs, and the like. And their owners use them for all sorts of different activities, from watersports to fishing and everything in between. Let’s take a look at some of the various types of pontoons you’ll encounter and what they’re designed to do. Yes, do the math and that’s 900 horsepower you see on the back of this Premier Dodici 310. If you’ve got a need for speed, a pontoon with lots of horsepower on the stern might just be your ticket. These “rocketoons,” as we’ve heard them called, can have as much as 900 ponies. And, with the right performance pontoon package as discussed above, you’ll be carving turns at thrilling speeds. Consider the Premier Dodici 310 or the Bennington 30 Club Twin for starters. The Dodici has three—yes three—300-horsepower Evinrude E-TEC two-stroke outboards and a top end of 60 MPH. There’s even a pub layout with a full stand-up bar and lounge seating. The Bennington Club twin has twin 300-horsepower Yamaha F300s, 300 square feet of deck space, and a 50 MPH top end. You’ll find no shortage of excuses to go fast in this category. Watch our Performance Pontoon Boats: The Need for Speed video, to learn more. And if finding the fastest of the fast is in your nature, read about 5 Rocket-Fast Pontoon Boats. The Manitou Xplode 23 SRS SHP is built for watersports such as skiing, tubing, and wake boarding. You can tow tubers, skiers, and wake boarders with just about any pontoon that has enough horsepower and some sort of towing pole or mount, but there’s a class of pontoons that are designed specifically for the tasks. They often have metal sport arches with towline mounts, brackets for boards and skis, and splashy graphics and interior schemes. The Aqua Patio AP 250 XP is one such watersports speed demon, equipped with a 350-horsepower Yamaha F350 four-stroke outboard. It’s also got a watersports tower, under-deck board stowage, and an overall sporty appearance that looks great going 60 MPH across the water. The Bennington 2575 QCW is equipped to the nines, including a custom mahogany fencing scheme. Luxury pontoons are all about comfort. Think sumptuous, buttery upholstery and seating arrangements so comfortable it feels as if you’re lying on a cloud. Top-end models have joystick steering, twin engines, huge chaise lounges, full stand-up bars, and cool-looking LED lighting and fencing schemes. A few examples of these cushy vessels include the Harris FloteBote Crowne 250, Premier Sunsation 270 Walk-On, and the Premier 290 Grand Entertainer. Watch our Luxury Pontoon Boats: Maximum Relaxation video, to learn more about this class of pontoon boats. This Sun Tracker Fishin’ Barge 20 DLX has rod holder, livewells, fishing chairs, and more. Just add fish. If your boating adventures have a bent toward the piscatorial, don’t for a second think that you’ll have any trouble finding a pontoon boat that suits your needs. In fact, these boats are great for fishing, with lots of deck space for livewells, fishing rods, and other tackle. Pontoon boats also generally have low draft, making them great for getting up into skinny water. Before you wet a line, whet your appetite by having a look at the Angler Qwest, Sun Tracker Bass Buggy 16, or Sun Tracker Fishin’ Barge 22 XP3. If you can’t catch fish from any of these fishy pontoons, you’re doing something wrong. And make sure to read Can a Pontoon Boat Be a Serious Fishing Boat? This article will point out the ups and downs of fishing-dedicated pontoons, and how well they serve their purpose. This Bennington, an excellent family pontoon, keeps it simple with a clean, easy layout. It’d be wrong to compare this class of pontoon boats to station wagons, so maybe it’s better to think of them as the SUVs of the sea: they do a number of things well. Whether sheer relaxation, exploring, or towing tubes is your game, a solid family pontoon has lots of lounge space, an ergonomic layout, and enough options to keep the comfort factor high. Some excellent boats in this category include the Aqua Patio WB, Sun Tracker Party Barge 24 XP3, and Harris FloteBote Solstice 240, among others. The Princecraft Vectra 23 offers a lot of value for the money. Like the Honda Civics or Toyota Corollas of the automotive world, some folks are looking for a solid, enjoyable pontoon that won’t drain their kids’ college funds. The good news is there are plenty of models to choose from, when it comes to buying a pontoon on a budget. And cheap isn’t necessarily a bad thing. Lots of manufacturers put together perfectly capable and comfy pontoons that will provide endless hours of entertainment, relaxation, and fun on the water—all at a reasonable price. Consider pontoons like the Princecraft Vectra 23, Paddle Qwest 614, or Sun Tracker Bass Buggy 16, among the many others available on the market. Be sure to watch Value Pontoon Boats: Get the Most Bang for your Buck, to learn more about this genre. All that’s left to do is get out and start looking. If a used pontoon boat is in your future, consider perusing the many listings right here on Yachtworld, where you’ll also find many new pontoon boats. Armed with the basics you should have no problem narrowing the field and finding the perfect pontoon boat for you. Editor’s Note: New boaters should read Boating Basics 101: Handling a Pontoon Boat, before hitting the water. Gary Reich is a Chesapeake Bay-based freelance writer and photojournalist with over 25 years of experience in the marine industry. 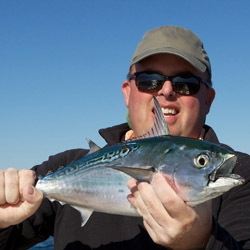 He is the former editor of PropTalk Magazine and was the managing editor of the Waterway Guide. His writing and photography have been published in PassageMaker Magazine, Soundings, Fly Fishing in Salt Waters, Yachting Magazine, and Lakeland Boating, among others.